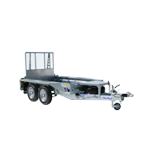 O’Haire Trailers presents the Ifor Williams plant trailer range. 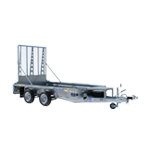 These plant trailers are purposely designed for transporting plant machinery. 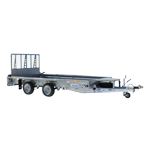 O’Haire Trailers has 3 models of plant trailer for sale; The GP, GX & GH Range. 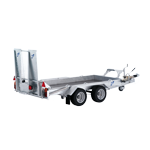 The Ifor Williams GP series trailers are regarded as the toughest plant trailers in the industry with an open rectangular steel framework, integral with the chassis. 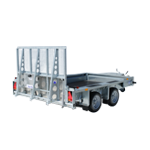 These GP trailers from Ifor Williams have a maximum gross weight of 3500kg. Models range from the smallest GP106 to the largest GP146. 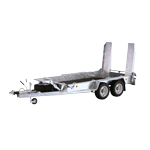 The GP models are available as tri-axle versions and come with 3 different tyre sizes. 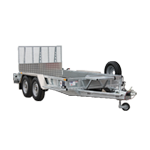 The Ifor Williams GX Series of plant trailers are built from folded pre-galvanized steel sections with filled-in sides for greater flexibility. The GX series are sold with hinged adjustable skids or a full-width loading ramp plus a built-in bucket rest as standard . A variety of sizes range from the smallest GX84 up to the largest GX126. 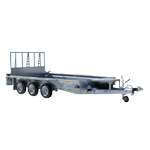 The Ifor Williams GX models are available with maximum gross weights of 2700kg and 3500kg. 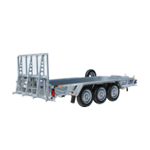 The GH range of plant trailers from Ifor Williams is the latest addition to its plant trailer range. 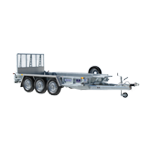 GH plant trailer models are designed with galvanized welded steel and are fitted with leaf spring suspension ensuring they will withstand tough conditions. The trailers can be viewed at the Paraic O’Haire Showrooms in Kilmaine County Mayo.